We know, we know. For many, wearing socks with any shoe style other than sneakers is unthinkable fashion faux pas. The socks-and-loafers duo in particular, though, has been around for ages and is making a stylish comeback. We're not complaining; the past couple seasons have blessed us with some of the coolest sock options we've ever seen. Think sheers, metallics, stripes, tie-dye, floral prints, and more. To be honest, our feet have never been happier. One street style muse we often turn to when it comes to wearing socks with loafers is Gala González. The Spanish It girl has been spotted on her Instagram over the past few years wearing the mix, and she's inspired us to prove just how easy it is to pull it off. It's as effortless as a sweater and skirt complete with simple ankle socks and classic black loafers. A more winter-friendly version is a standout coat and a pair of jeans along with the socks and shoes. However, one of her best looks incorporates a cool black mesh sock. Read on to shop our editors' top sock picks of the season that make the perfect companion to your favorite loafers. Plus, we shared some of Gala González's best outfits with the duo that will likely inspire you to try the trend. Add a metallic flash to your look with sparkling pair of socks. This tie-dye pair is excellent for making a statement. These fishnet socks are undoubtedly street style–worthy. Go pretty in pink with this fun, sheer pair of socks. Dark florals add an interesting detail to even the most minimal of outfits. Gonzalez wore this sock-and-loafer trend with a printed sweater, mini bag, and ruffled skirt. These masculine-inspired pinstripe socks are incredibly chic. Go all out with this pair—not only is it metallic, it's two-toned as well. This gold foil pair is perfect for your next holiday party outfit. 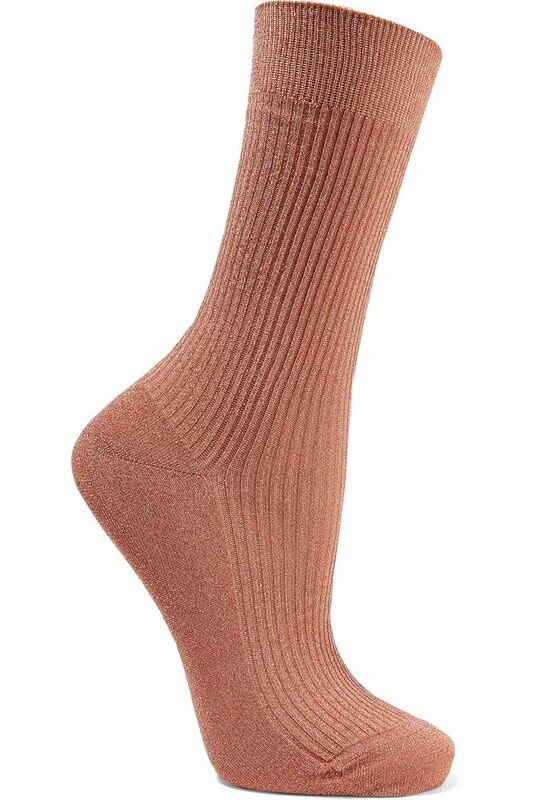 This textured sock style is a great addition to your collection. This pink sheer pair is almost too pretty to wear. Another great fishnet pair to try with loafers. Velour is one of our favorite fabrics of the moment, so much so, we'd wear it on our feet. This dramatic striped pair of socks is great for fall and winter. Major yes to this polka-dotted pair. In the colder months opt to wear this sock and loafer mix with jeans and a cozy jacket. Go classic and a touch preppy with this cream pair. Burgundy socks with a bit of sparkle are a-okay in our book. Rainbow Bright-inspired socks we can get on board with. How chic is this coppery ribbed velvet option? We always love a good stripe. This pair feels retro and luxe all at once. While lounging around at home, try a pair of soft ribbed socks and comfy loafers. This cozy gray pair is great for cold days. Florals for your feet? Yes, please. Here Gala completes her sweater and leather midi skirt look with a green pair of ankle socks and classic black loafers. Green socks haven't really grabbed our attention until now. We're just a little obsessed with this tie-dyed pair. Mix up your black sock collection with this sheer stripe option. These floral socks are like art for your feet. Go bold with your next mini-skirt look and add a pair of mesh ankle socks and statement loafers. These are a favorite of It-girls all around the globe. These aren't your usual white socks. Try this statement-making pair. For inspiration on how to wear your loafers, check out this fresh outfit inspiration.